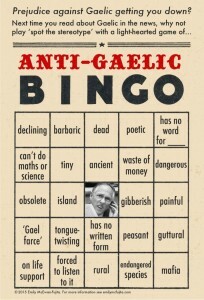 Researcher Emily McEwan-Fujita has created the excellent Anti-Gaelic Bingo. “Is there a topic that you know a lot about, but that most people can only seem to grasp through stereotypes and misconceptions? A situation where no matter how hard you try, you cannot debunk people’s wrong-headed ideas? Scottish Gaelic language and culture is like that. Even in Scotland. In fact, the Scottish media are a good place to find stereotypes, misconceptions, lies, and crazy ideas about Gaelic that just. Won’t. Die….Here are two bingo cards to use when you read newspaper articles about Gaelic. 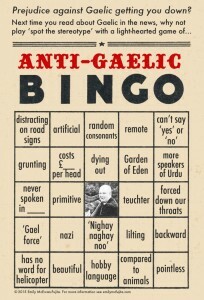 Playing a round of “anti-Gaelic bingo” will help you to spot the stereotypes, lies, and crazy ideas that are continually circulating, and recognize them for what they are. Consider it a form of cheap therapy to help you deal with the prejudice and misunderstanding. ‘Se ur beatha. Braw idea. Mibbies they’ll bring oot a “Anti-Scots Bingo” vairsion forbye. Whit wid be on it, though? 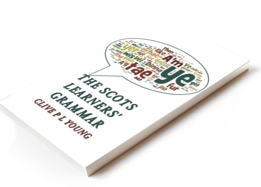 Hoo aboot…dead or dying, has no grammar, has no standards, just a dialect of English like Brummie, old-fashioned, economically useless, Chewin the Fat, would stop children learning good English, working-class, can’t be taught, language of The Scheme, uneducated, reduced to a few dialects like Doric, rural, waste of money, artificial, an SNP plot, only spoken by pensioners, rough and unpleasant, Oor Wullie, Glaswegian/Doric/Shetland isn’t Scots, slang, Lallans, bad English, has no word for___, will have to wait till independence anyway…whit hae A missed?